Join the discussion on our forums! Come discuss Power Word: Replicate over in our dedicated Power Word: Replicate discussion topic. Choose a friendly minion. Summon a 5/5 copy of it. Available as a bundle, along with Power Words: Detonate, Animate, Annihilate, and Paper Weight. not too many minions are good as a 5 mana 5/5 and more importantly you need that minion to be on the board. It's a Shadow Essence that fits in an Odd Priest Deck. Harder to pull off, but definitely playable and worth putting in a deck, especially for buffing low level minions with good effects. the epic everybody hates to pull. DUST ! Dust it! Dust it with fire! Damn is this card good... Imagine playing this on a Carnivorous Cube and then destroy it yourself with Shadow Word: Death ... This is so much value! Dark Pact Who? Am I right? 5 Mana to summon a 5/5 if you have a minion on board, so value generation if you also want a decently sized minion. but you can choose what you get. It's basically a worse Faceless Manipulator as a spell, good for Big Priest since it's not a minion. 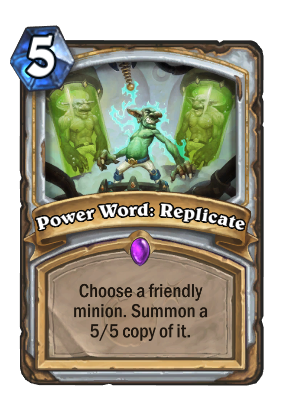 Priest already can create copies of minions. Decks can run Vivid Nightmare , Mirage Caller , Lesser Diamond Spellstone , Shadow Essence , Eternal Servitude ; the list goes on in wild. This seems like it is a packfiller version of a spell - nothing new, just flavor for the "cloning lab" theme. If you want to make an OTK with this card, just use Vivid Nightmare. This card, seems, for the tempo decks because in tempo decks you care about stats. They seem to want make summon 5/5 priest a thing with all possible ways. Well, You can discount this with Radiant Elemental, copy it with Shadow Visions, trigger abilities related to spells like Lyra or Master Cloner, copy weaker statted minion with powerful ability (like 1/1's summoned with Twilight's Call or Zerek's Cloning Gallery), and of course, play it WITH faceless manipulator and dual copy enemy Tirion. There could be more people might come up with, but these are just what I could thought of right now. There is potential for it, but it seems obvious that with this theme that Blizz is doing with priest. They want them to play more tempo/deathrattle without question. Yeah, Blizzard really pushed Togwaggle Druid, they made so much cards specially for it!